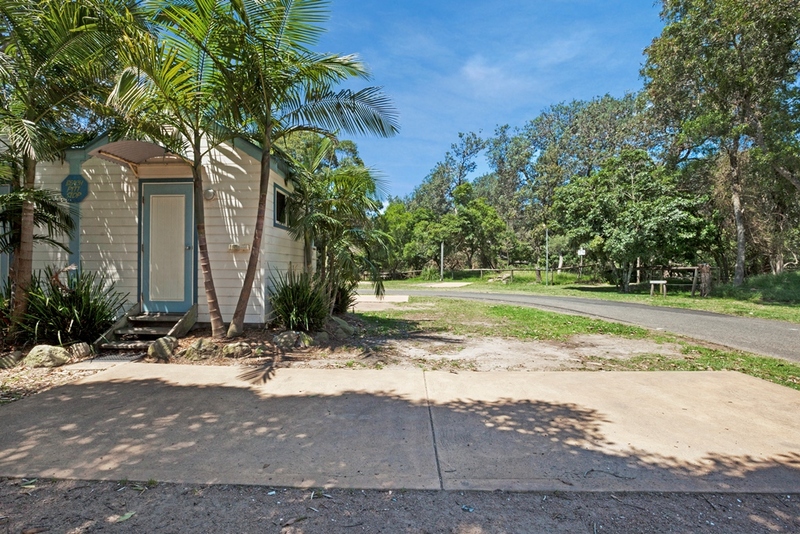 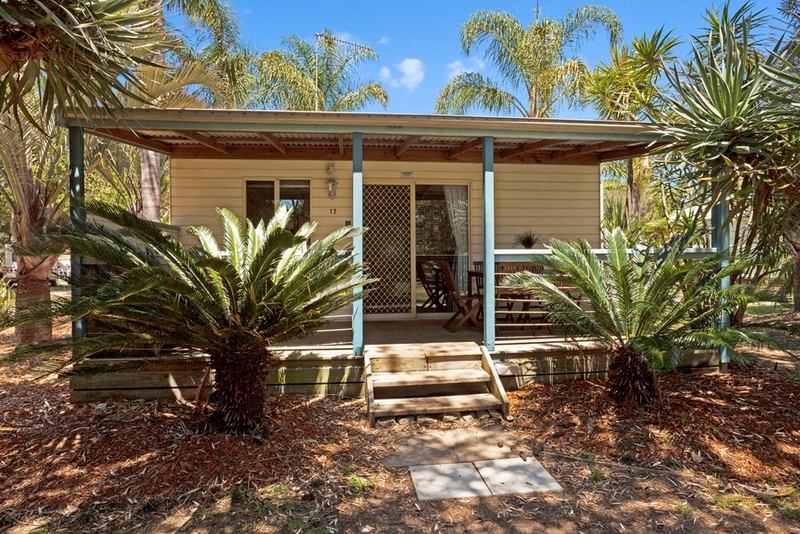 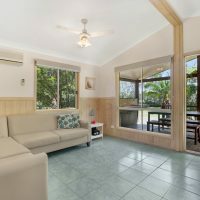 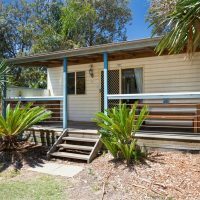 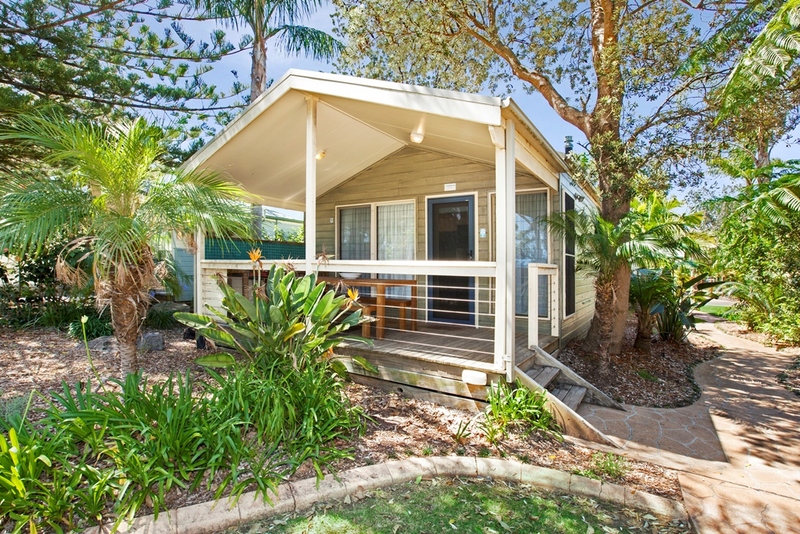 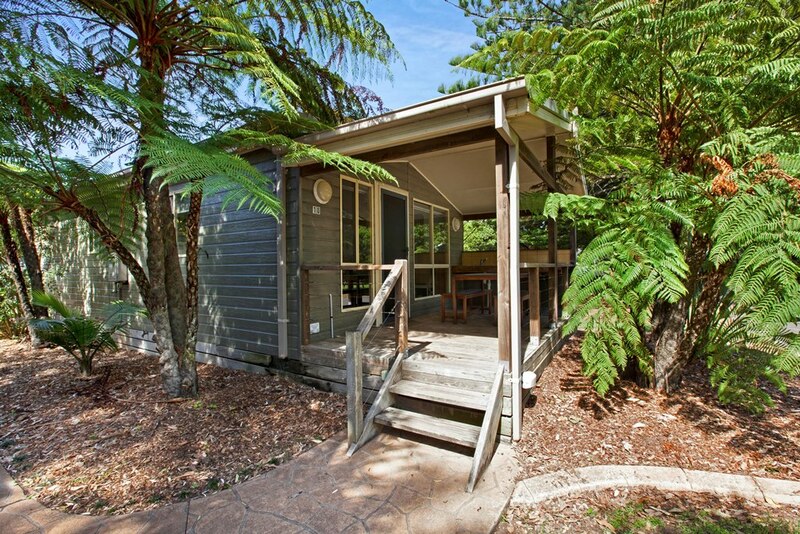 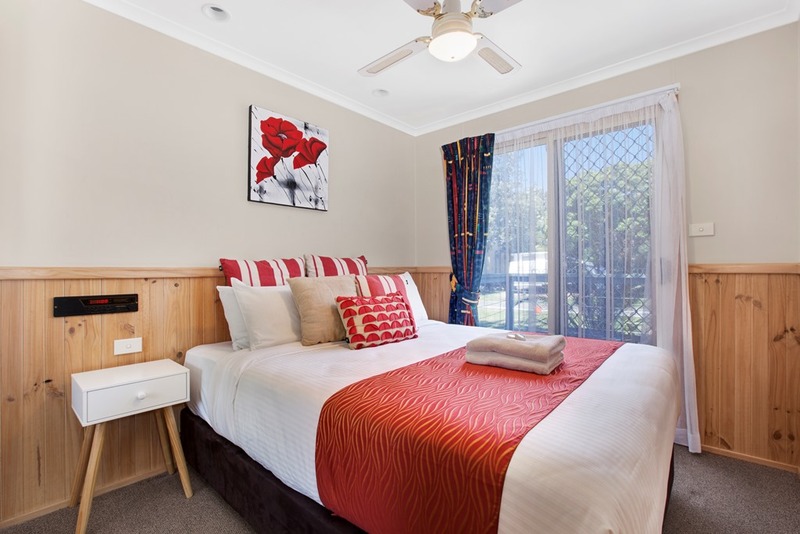 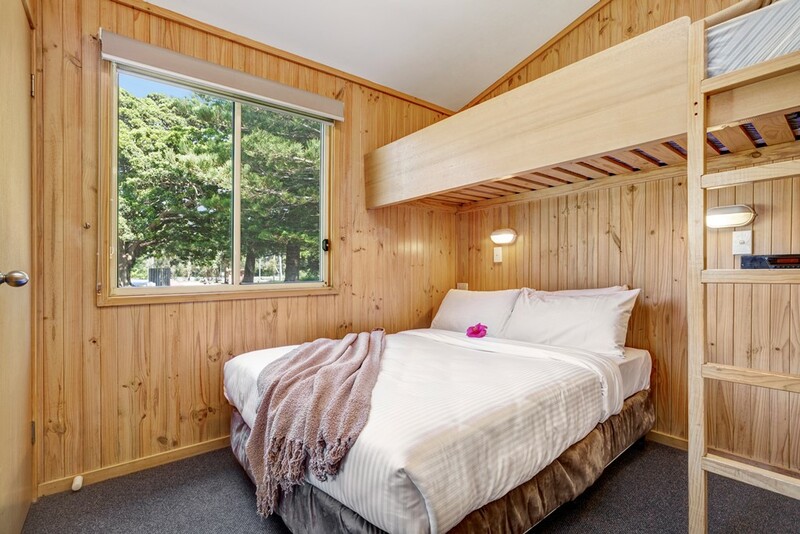 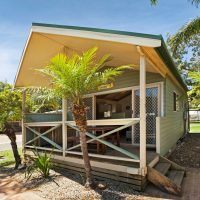 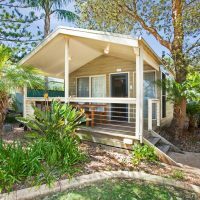 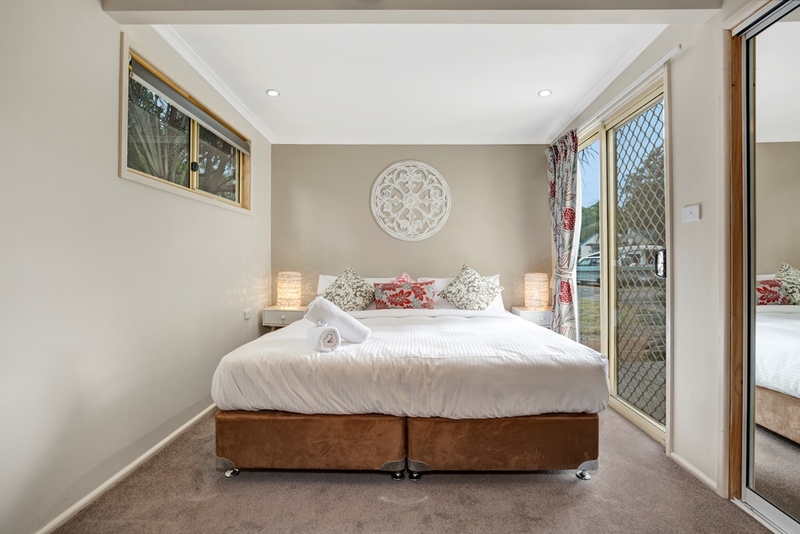 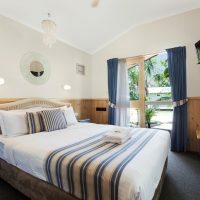 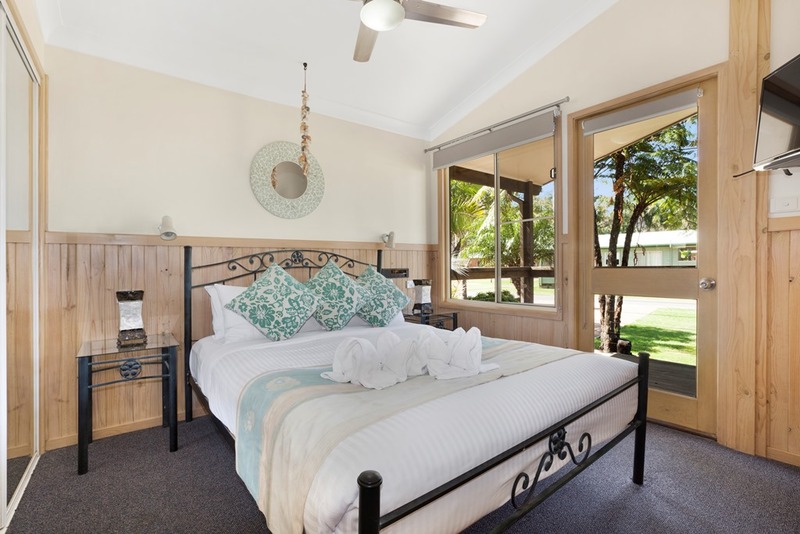 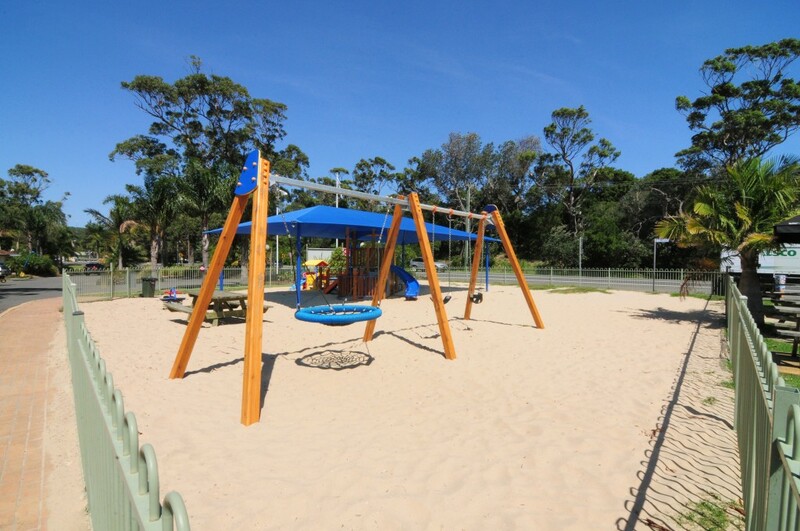 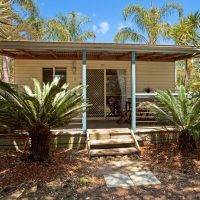 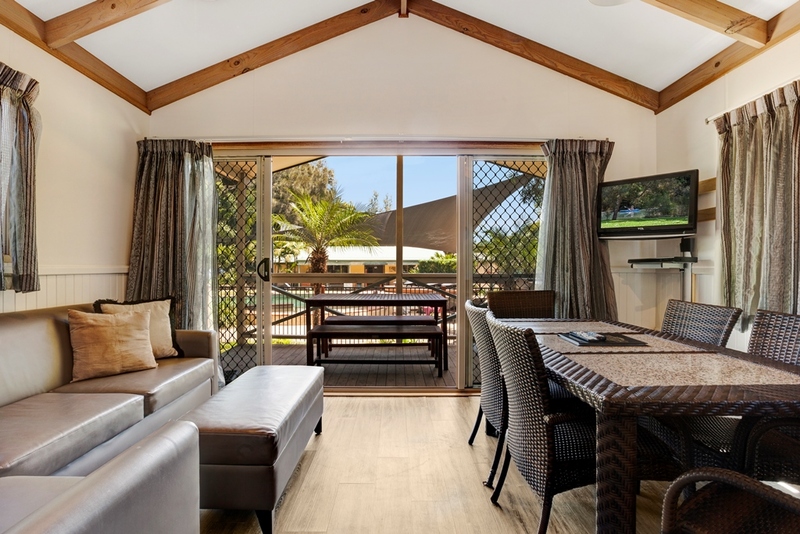 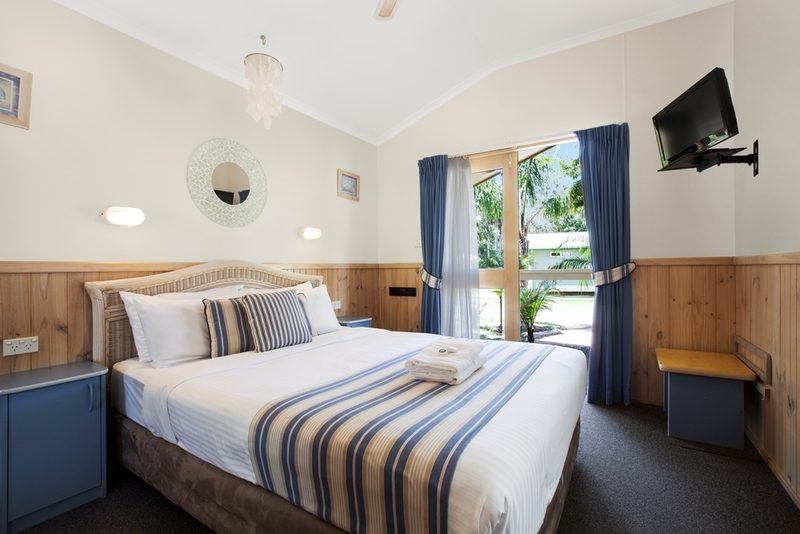 Seven Mile Beach Holiday Park is modern, beautifully furnished, well-appointed and fully self-contained. 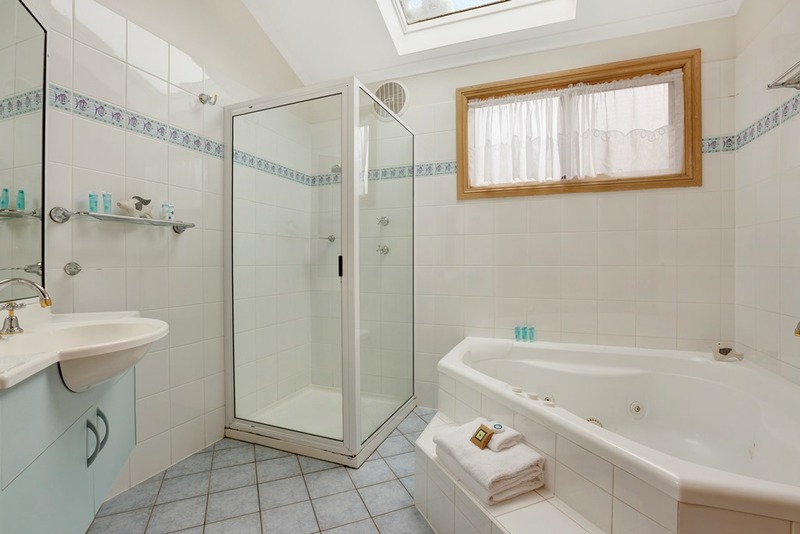 Our Deluxe Family Spa Cabin has a huge oval spa in its large bathroom. 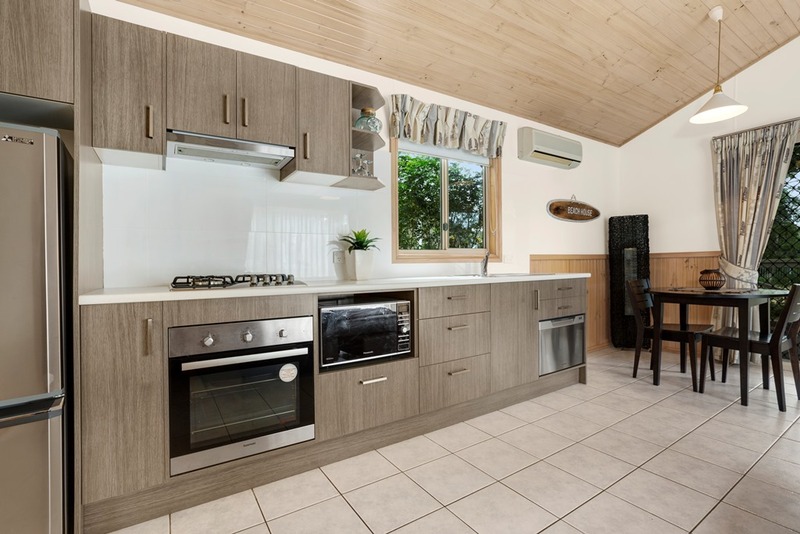 A stunning refurbished full size kitchen and gas log fire. 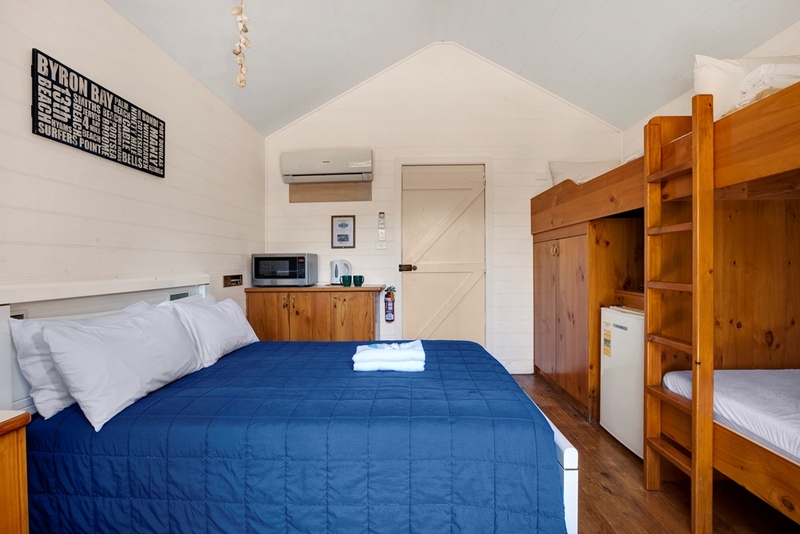 This cabin includes a private laundry. 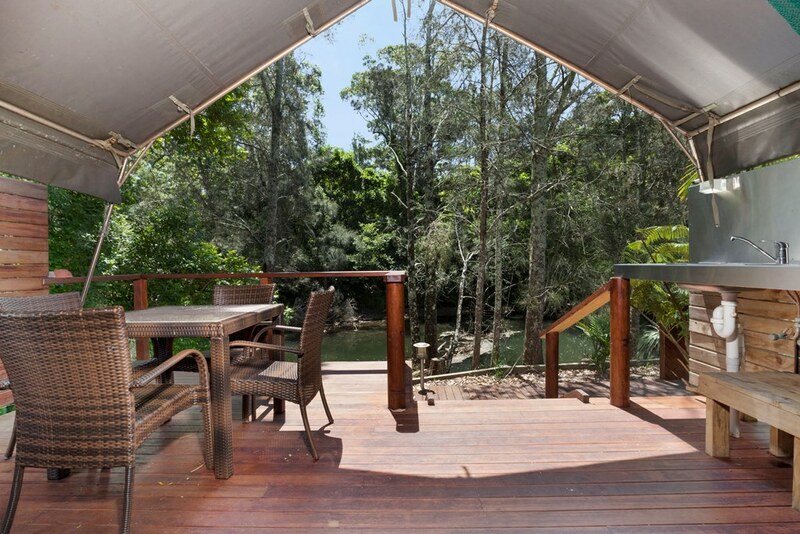 The Deluxe Spa Cabin has a large private balcony with an outdoor setting and a BBQ with views across the river. 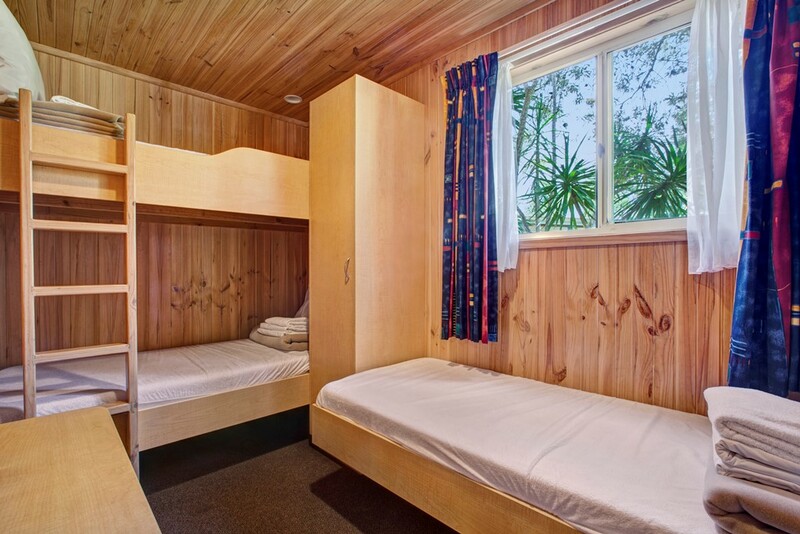 This cabin has reverse cycle A/C and free in-house movies. 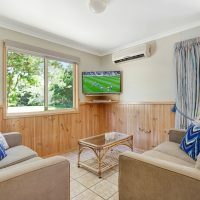 The cabin has have a lounge area and complete dining setting, TV, DVD Player, iron/ironing board, ceiling fans, hairdryer, CD player and radio. 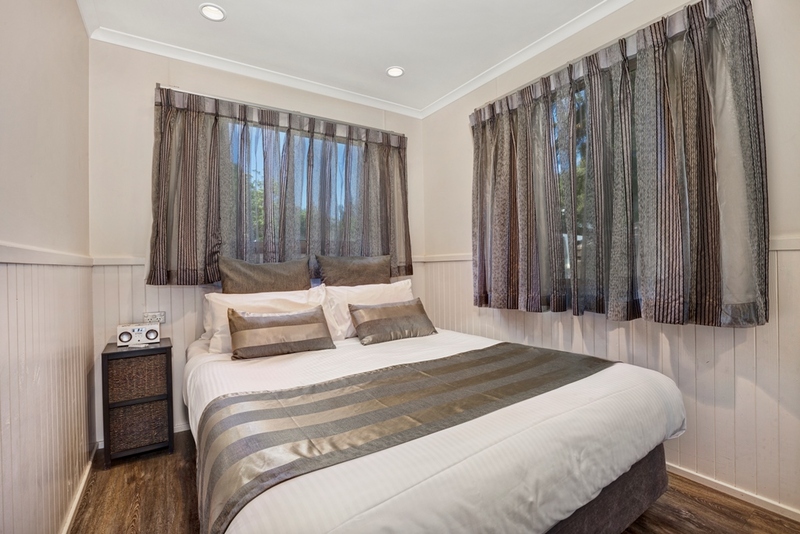 All linen is fully supplied. 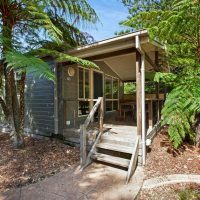 These spa cabins are fully equipped, spacious and are located on the beachside of our park but have views of our stunning river. 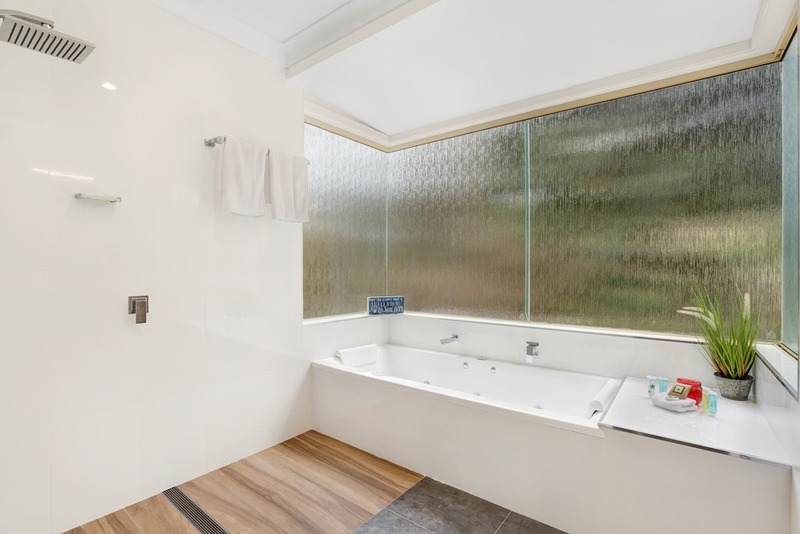 The greatest feature of these Cabins is the spa baths in the bathroom. 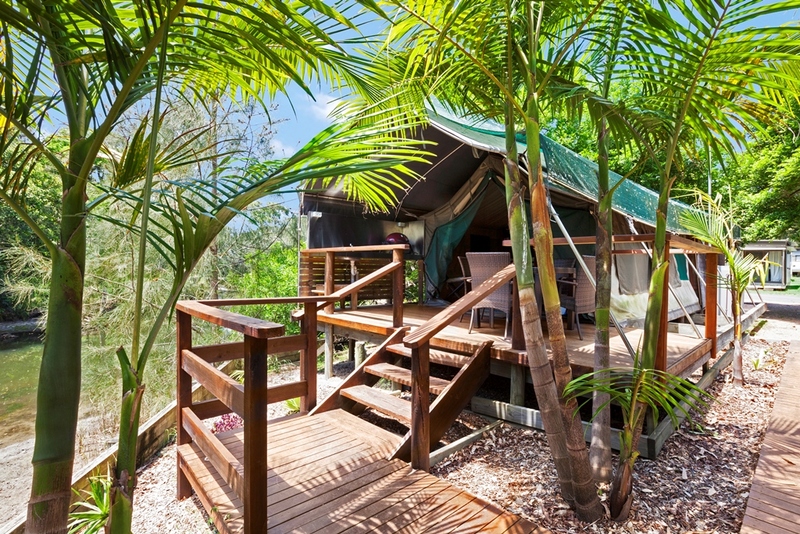 The Spa Cabins have private verandas with outdoor settings and BBQs. 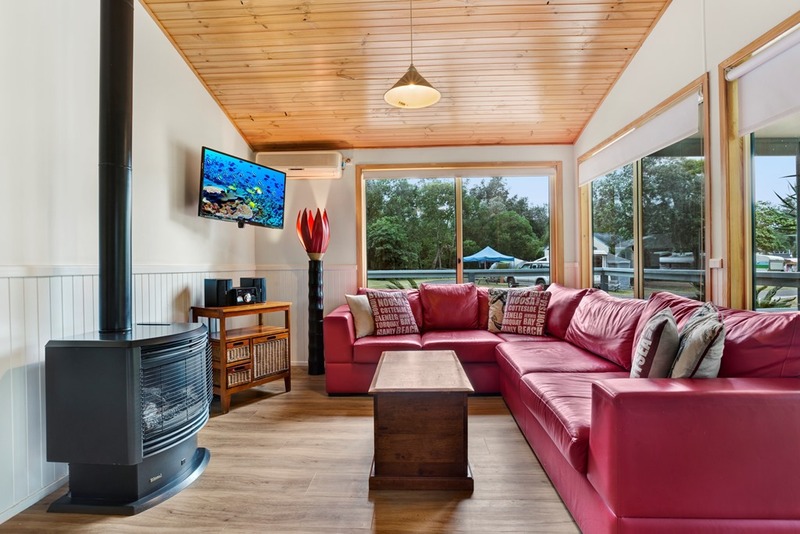 The Spa Cabins have reverse cycle A/C and free in-house movies, lounge/living area and complete dining setting. 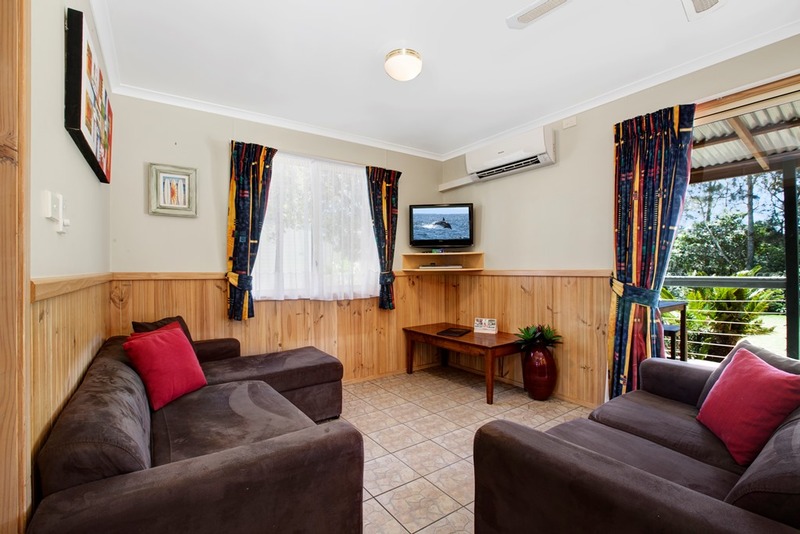 The Spa Cabins have TV, DVD Player, iron/ironing board, ceiling fans, hairdryer, CD player and radio. 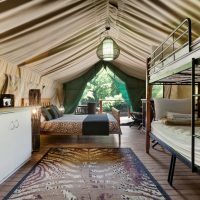 All linen is fully supplied. 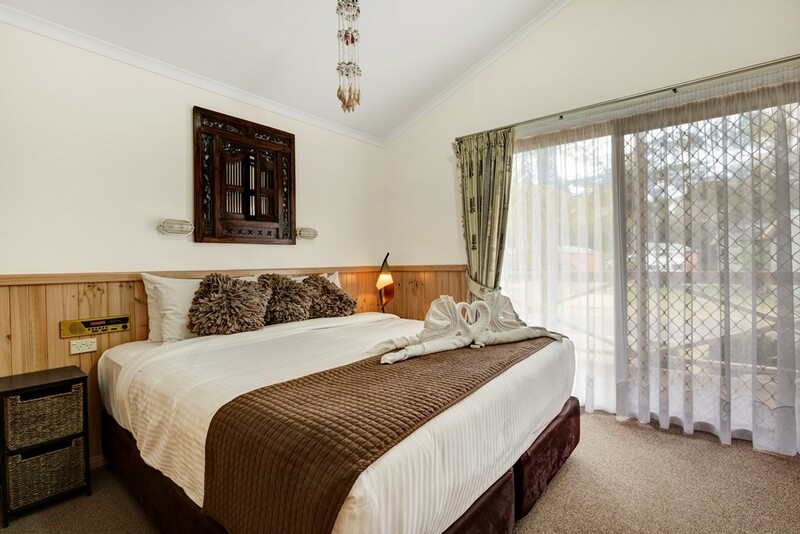 The Honeymoon Spa Cabin is a luxury cabin, ideal for a romantic weekend for two. 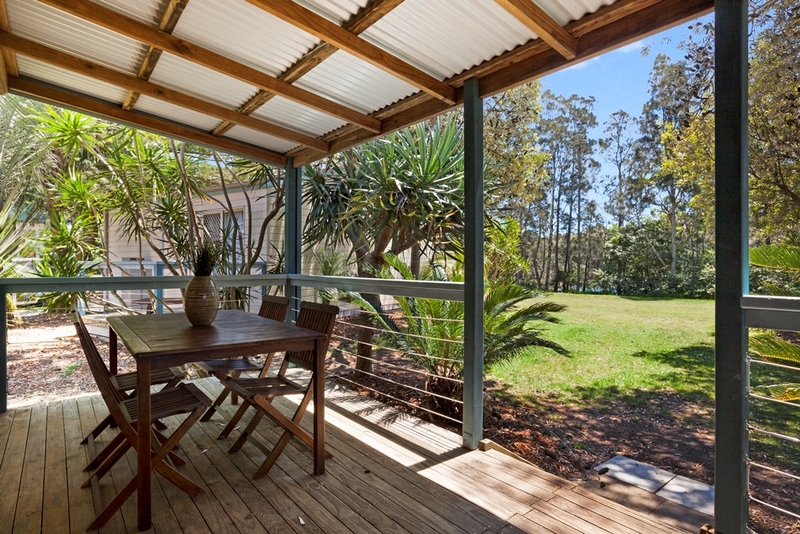 It features 2 balconies one with river views and the other a small deck off the bedroom. 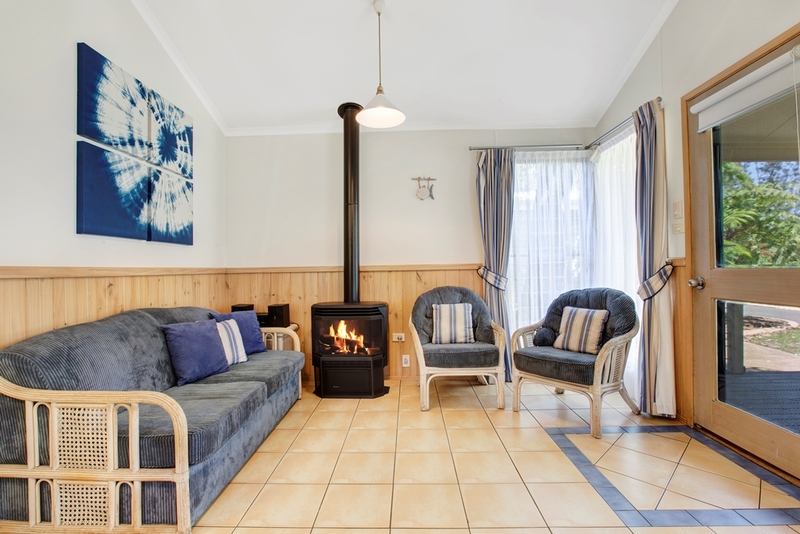 It features a Gas log fire and refurbished kitchen, fully equipped. 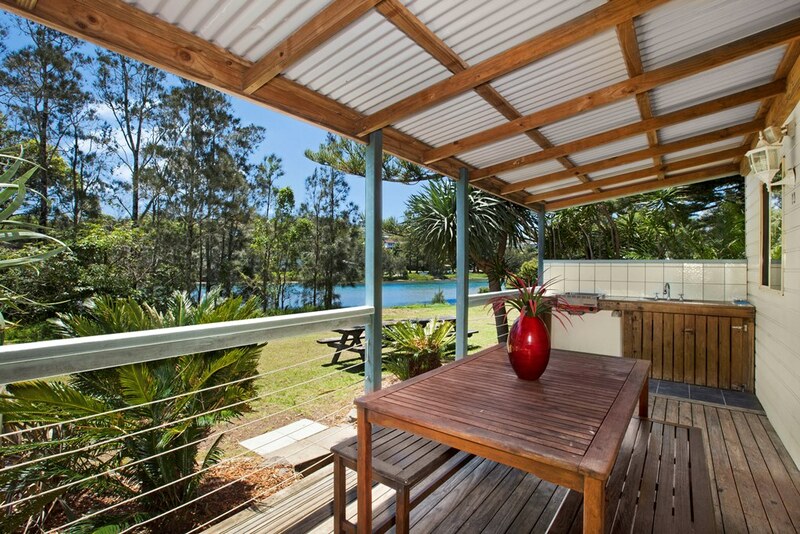 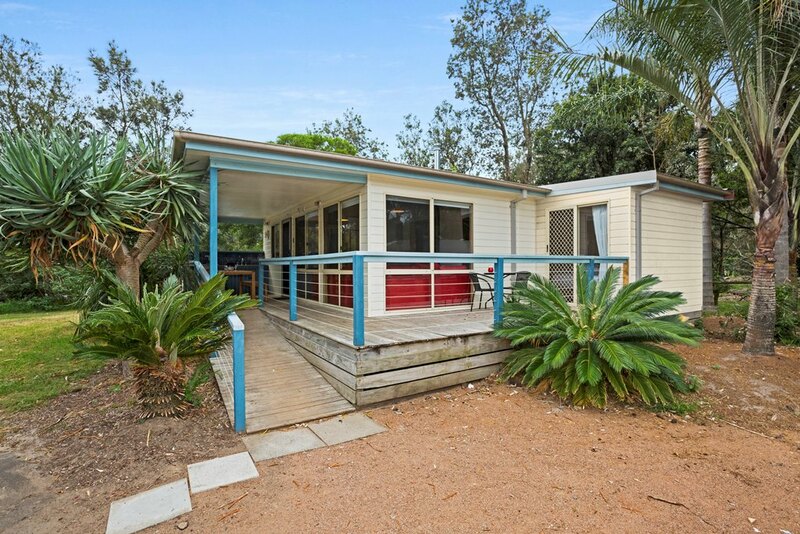 The large front balcony has river views and a private BBQ. 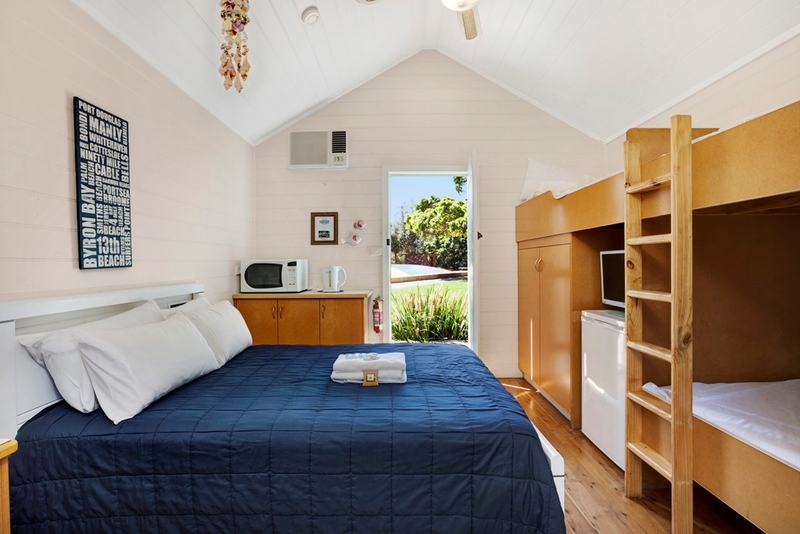 This cabin also has a large bathroom featuring a spa. 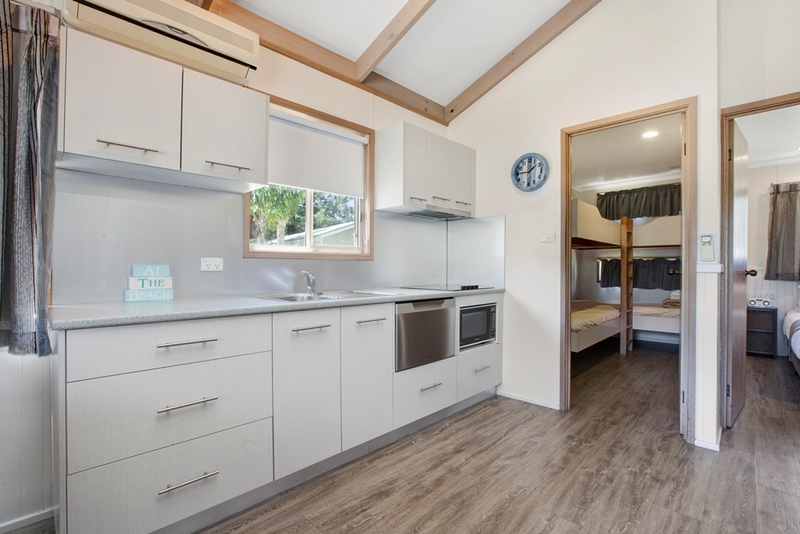 All linen is fully supplied. 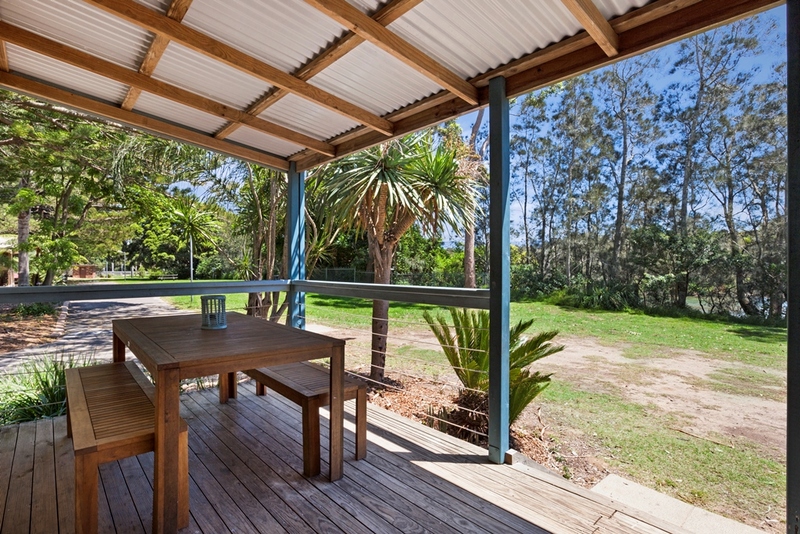 Our Beach Huts feature spacious, open plan living areas in a tranquil location with views overlooking the river. 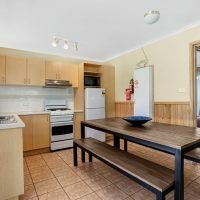 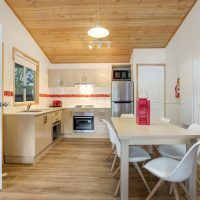 They are well-equipped with full size kitchens which include: tea and coffee making facilities, a toaster, stove top, oven and fridge. 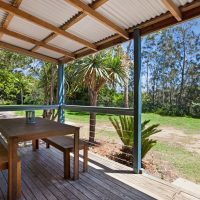 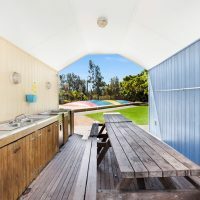 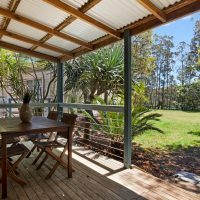 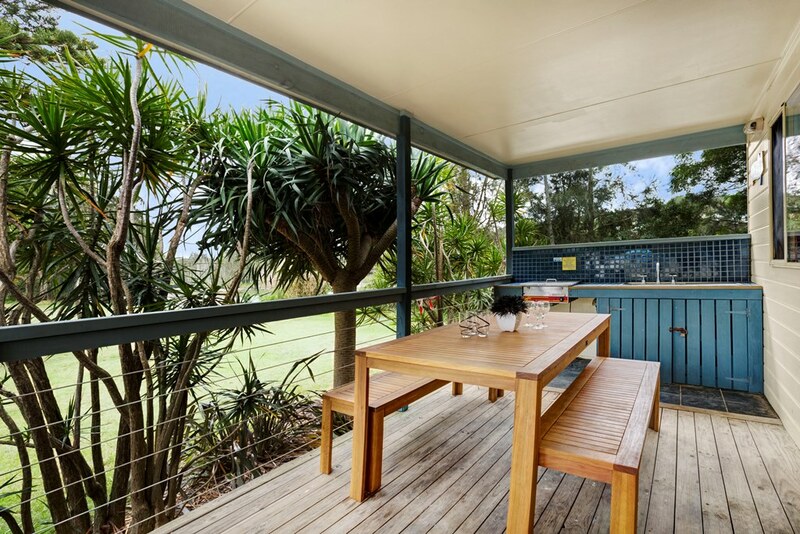 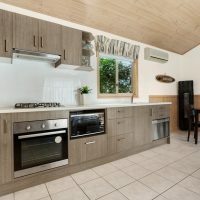 The huts have wide verandas and are all fitted with outdoor BBQs and outdoor settings. 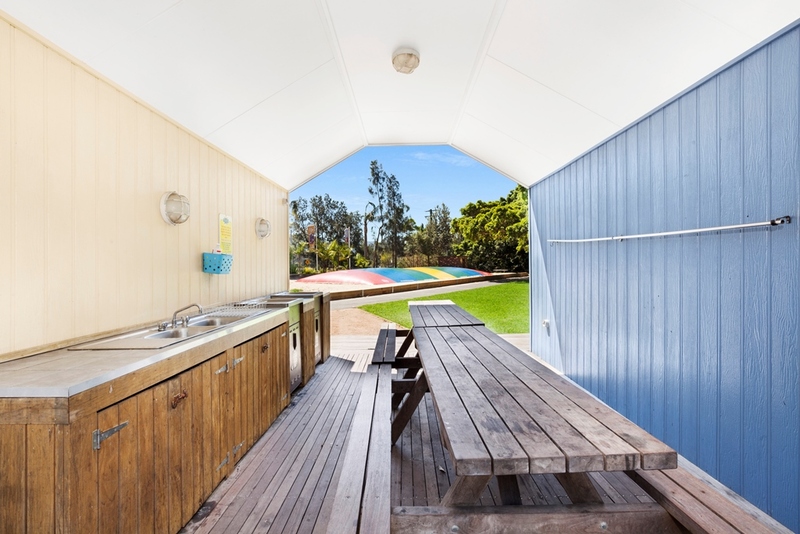 All Beach Huts have reverse cycle A/C and free in-house movies. 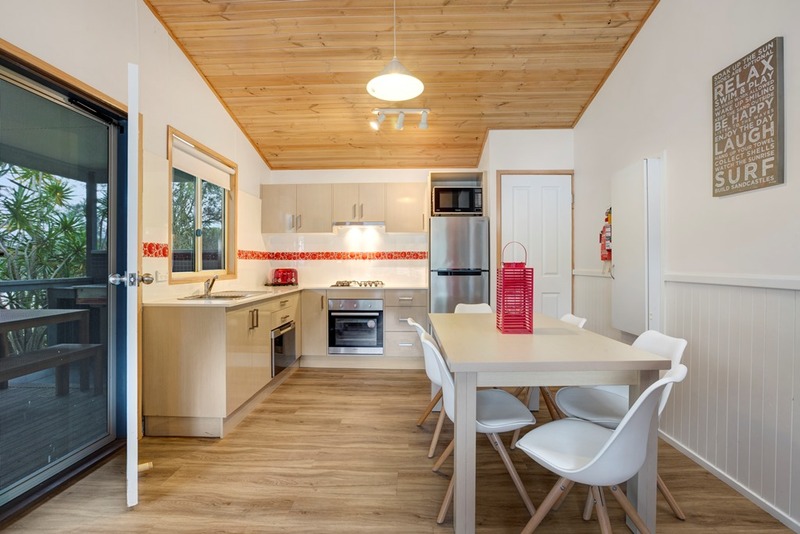 The huts have a lounge area and complete dining setting, TV, DVD Player, iron/ironing board, ceiling fans, hairdryer, CD player and radio. 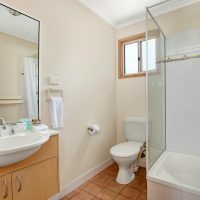 All linen is fully supplied. 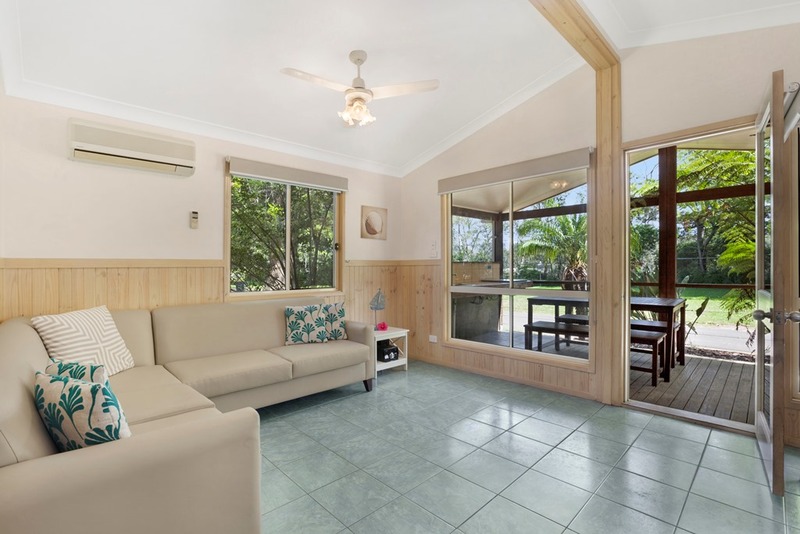 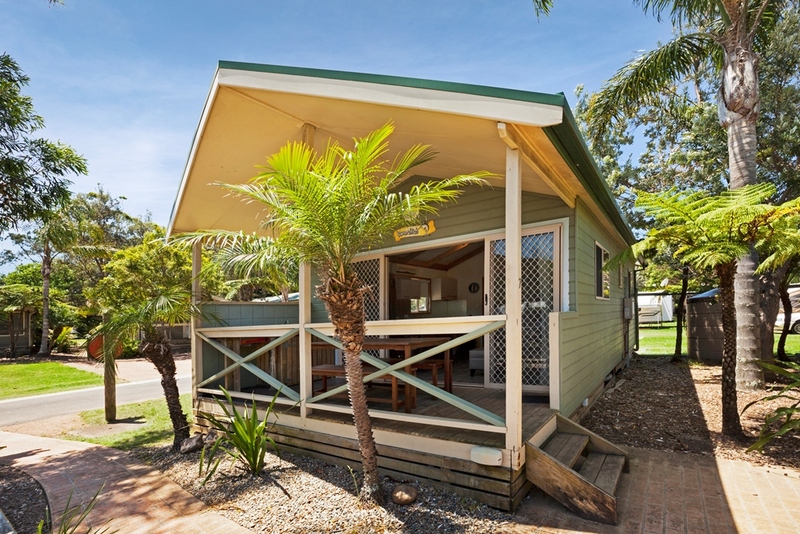 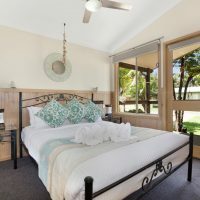 Our Beachside cabins feature spacious, open plan living areas in a tranquil location backing on to Seven Mile Beach. 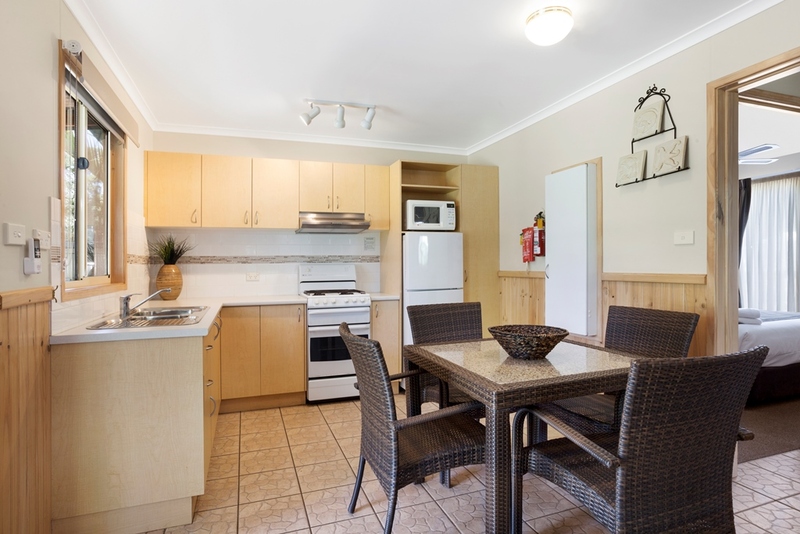 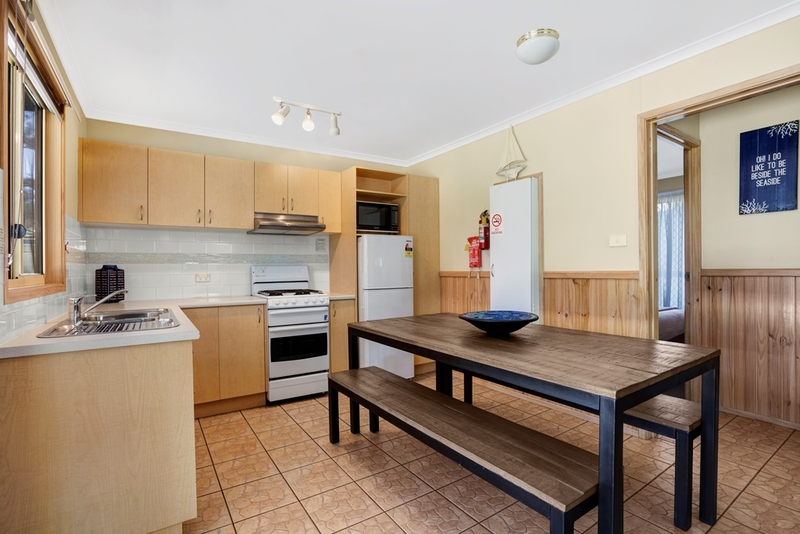 They have full size kitchens which include: tea and coffee making facilities, a toaster, stove top, oven and fridge. 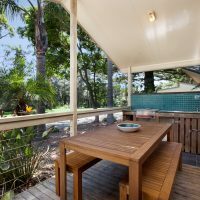 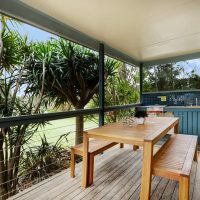 They each have a veranda and are all fitted BBQs and outdoor settings. 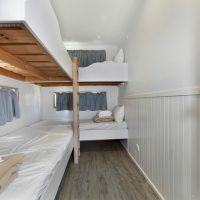 All cabins have reverse cycle A/C and free in-house movies. 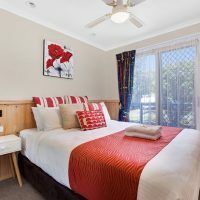 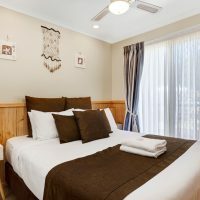 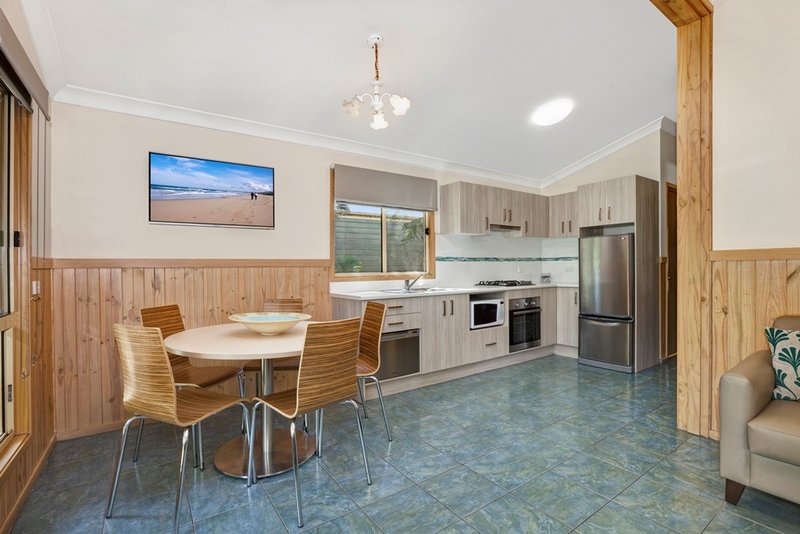 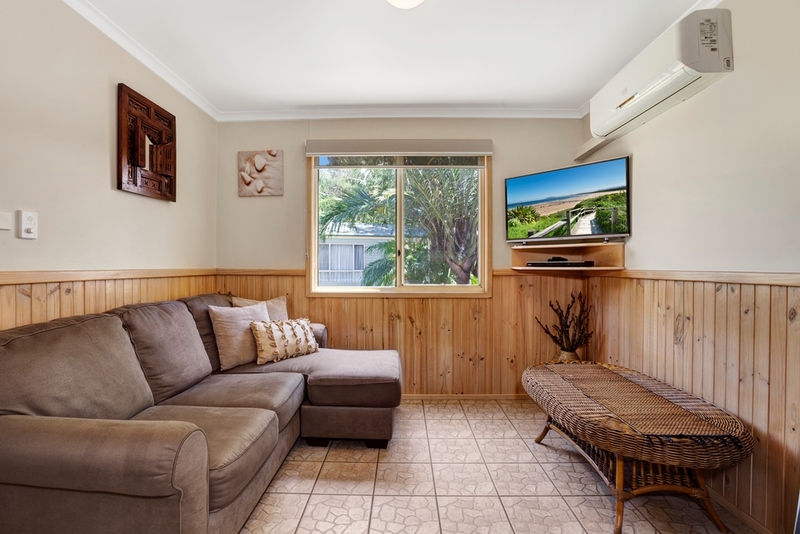 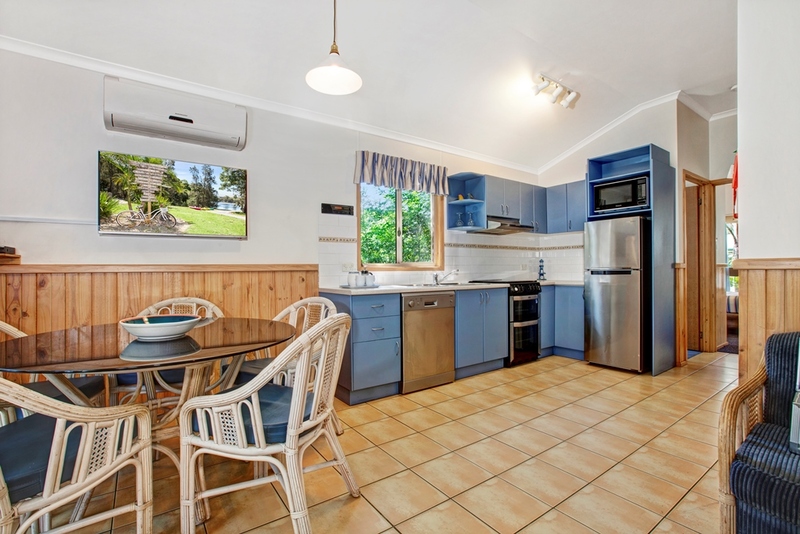 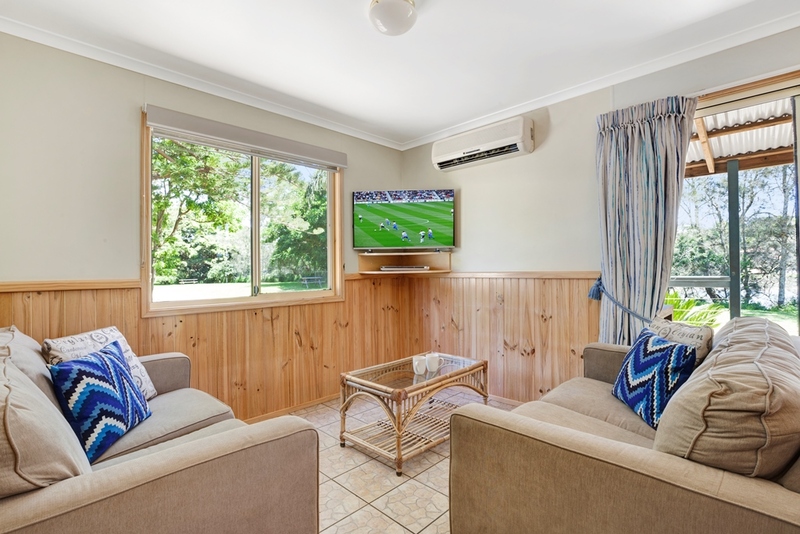 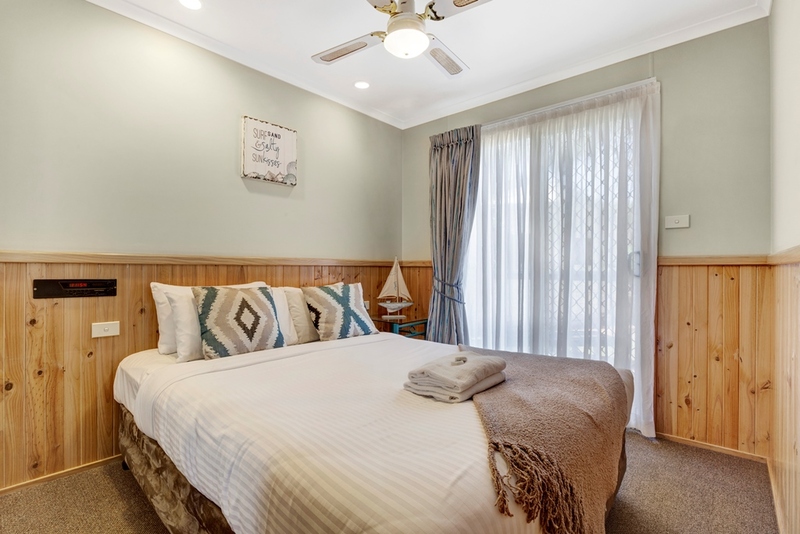 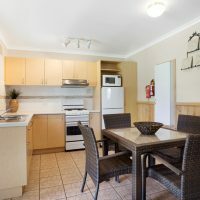 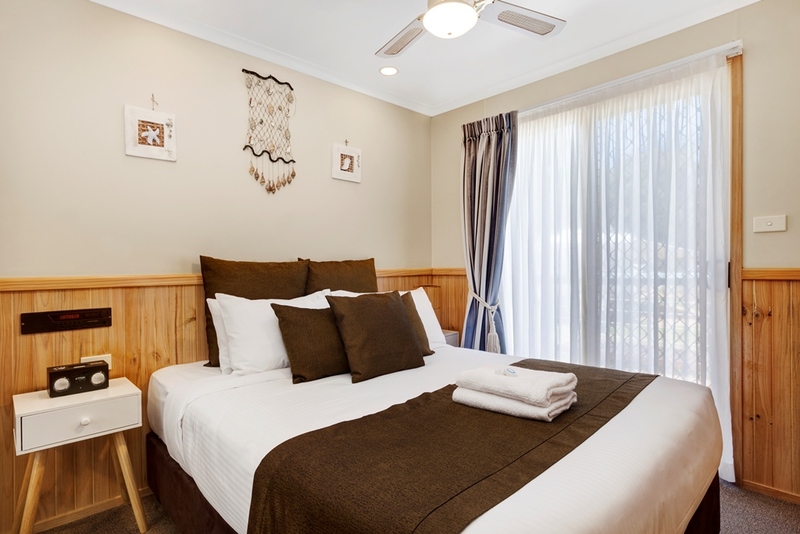 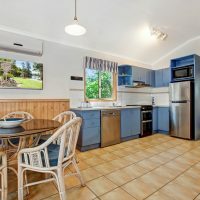 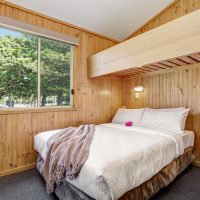 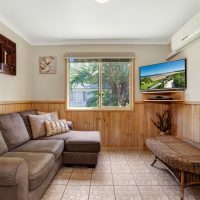 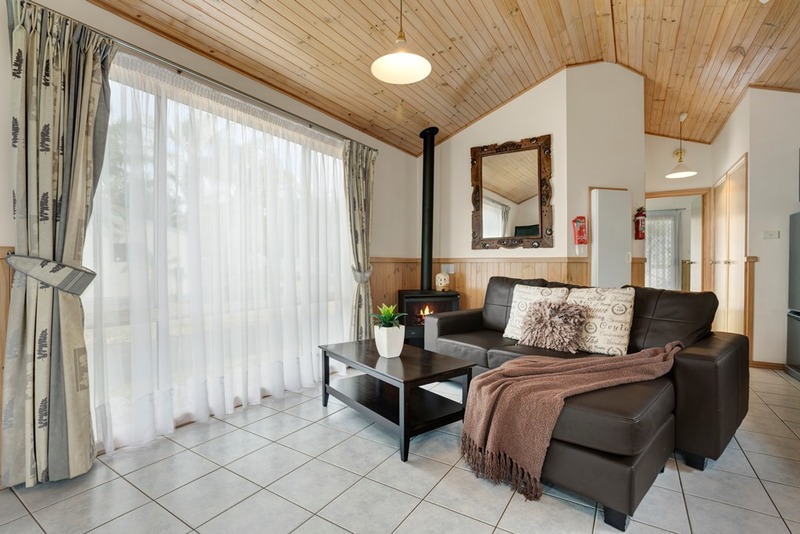 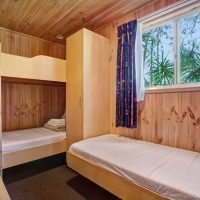 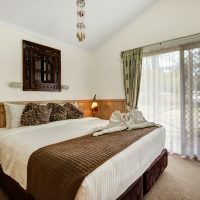 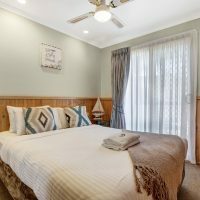 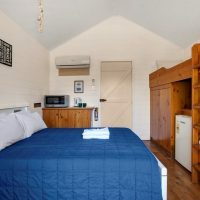 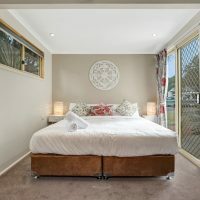 These cabins have complete dining settings, lounge area with a TV and DVD Player, iron/ironing board, ceiling fans, hairdryer, CD player and radio. 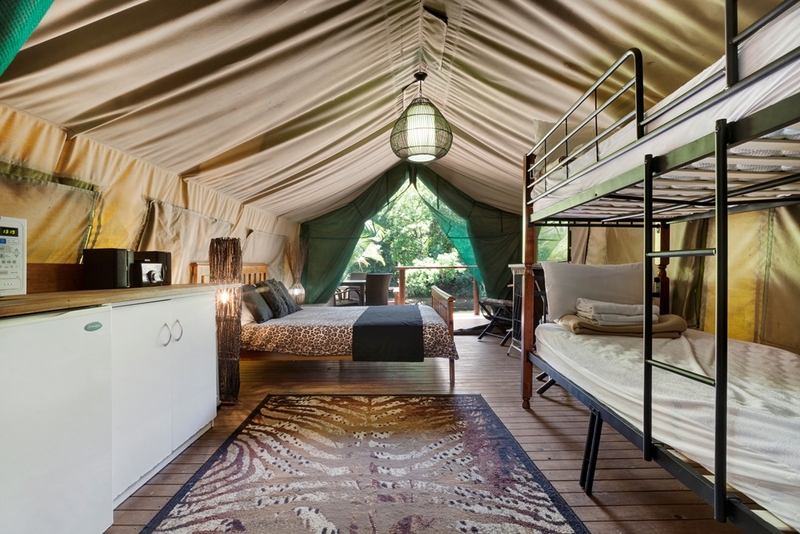 All linen is fully supplied. 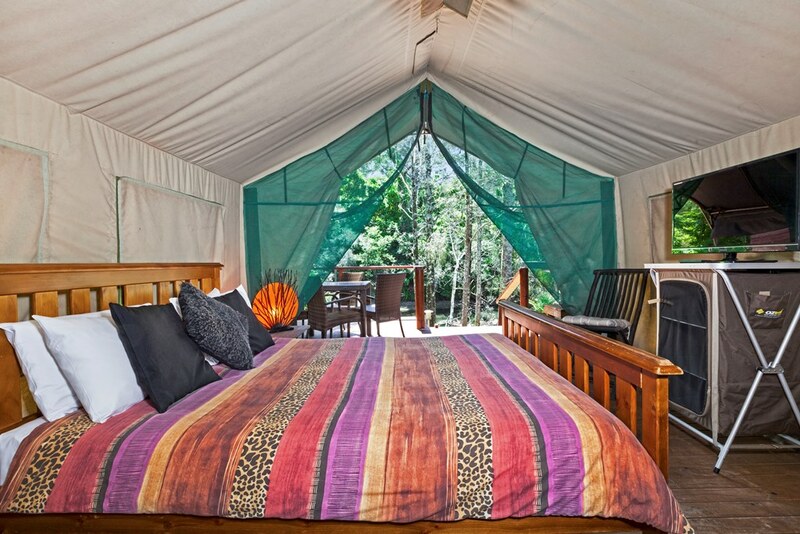 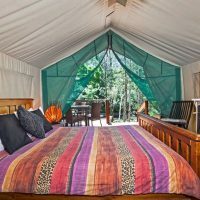 Our Safari Tents are in a tranquil riverfront location, with secluded river views. 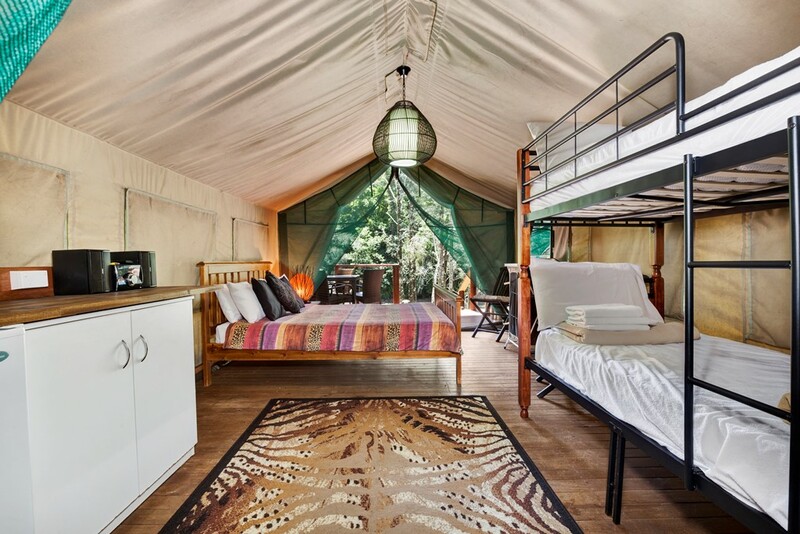 The Safari Tents include: a kitchenette with tea/coffee making facilities, kettle, toaster, small fridge, microwave. 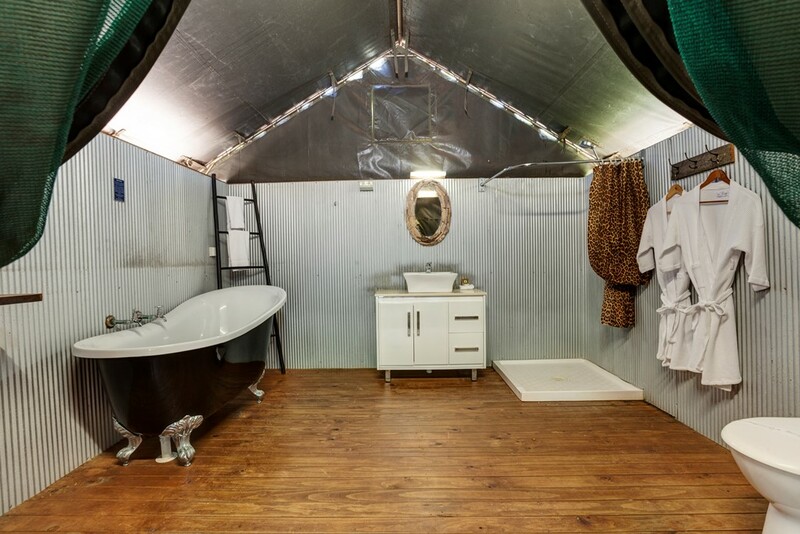 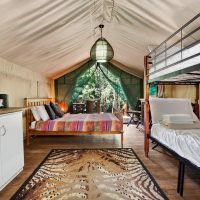 The tents have an ensuite bathroom with a toilet, shower, vanity and a luxurious claw foot bath. 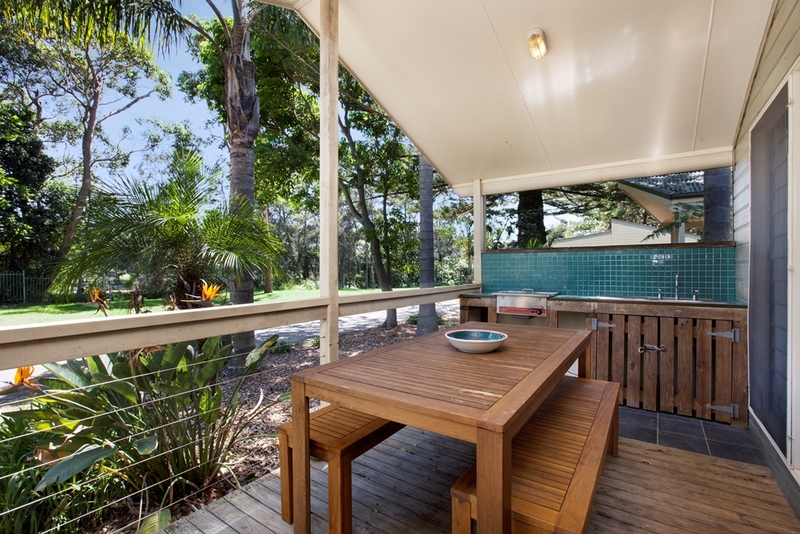 They all have wide front decks with outdoor settings and BBQs on each. 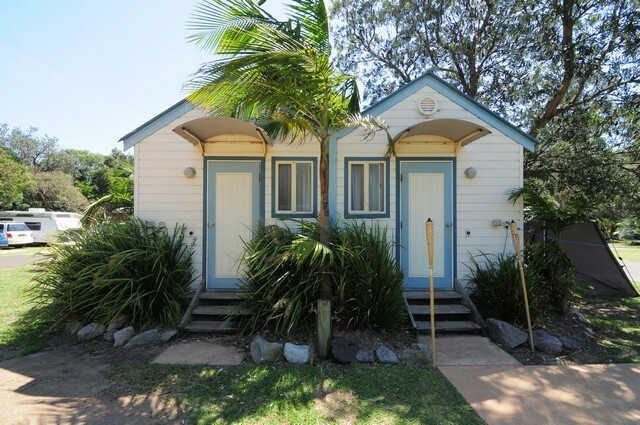 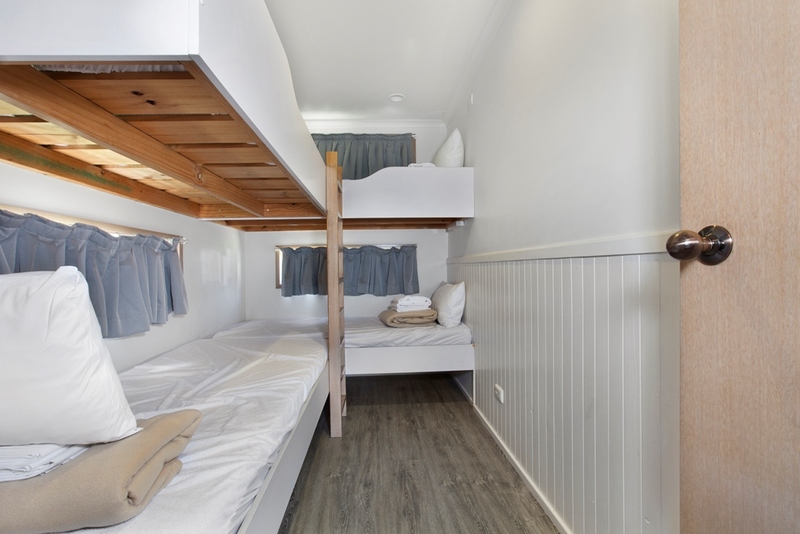 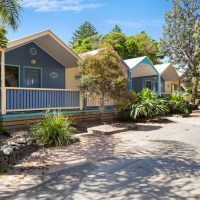 These are our groovy studio style accommodation with shared bathroom/ammeniity facilities. 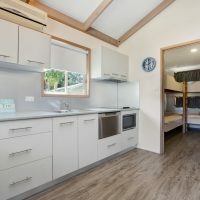 They include: TV, DVD player, in-house movies, wardrobe/storage, coffee and tea making facilities, microwave, bar fridge, ceiling fan, front and rear deck, shared BBQ area and reverse cycle A/C in each Shak. 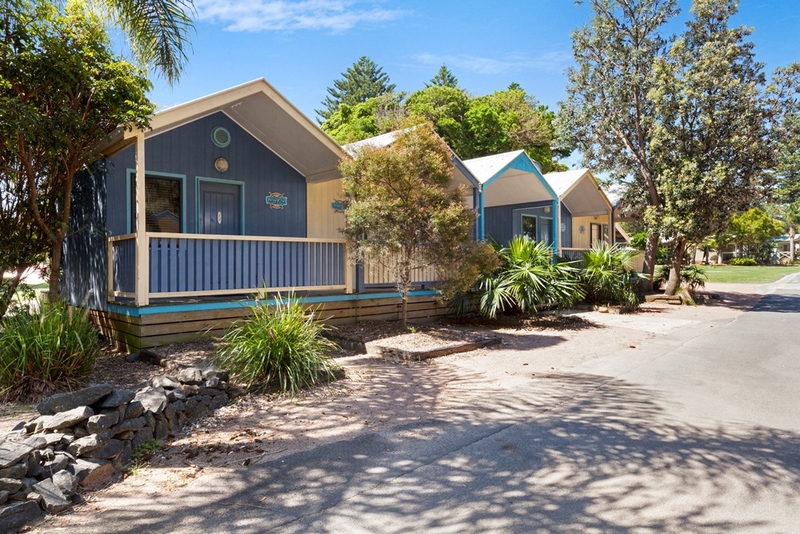 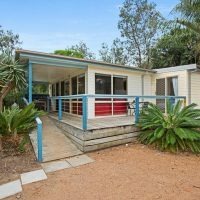 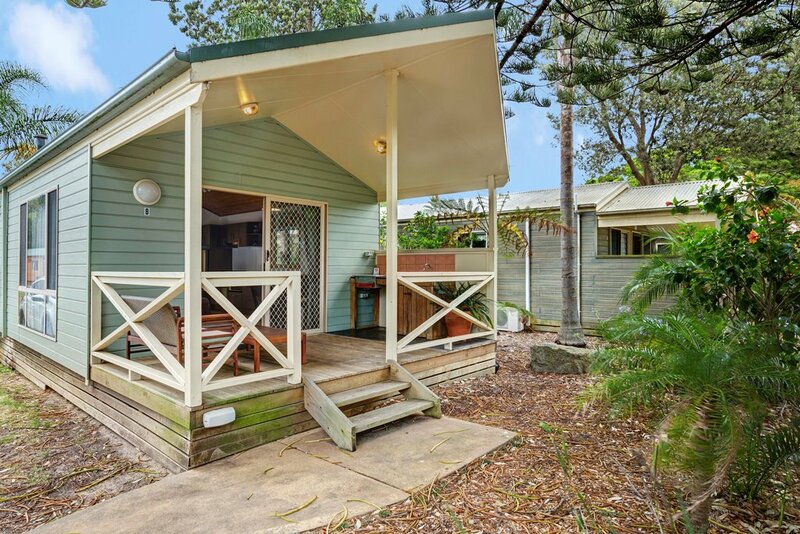 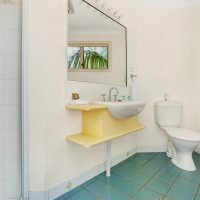 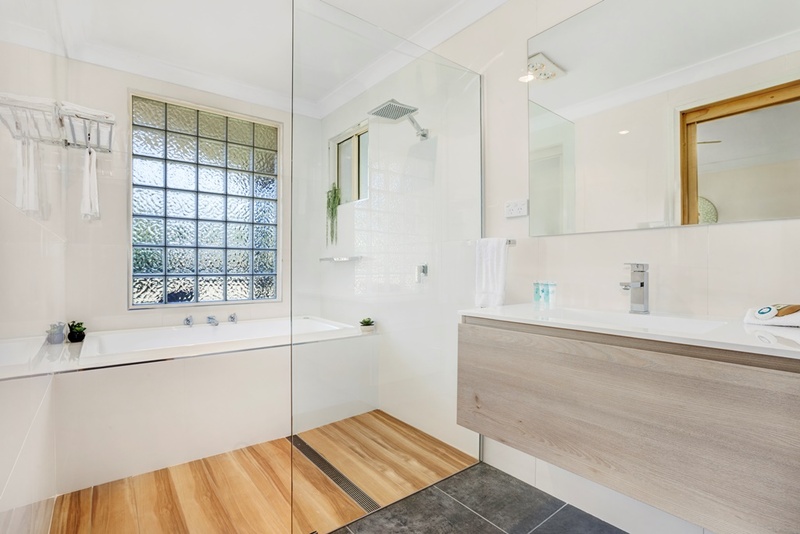 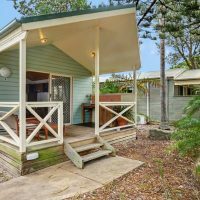 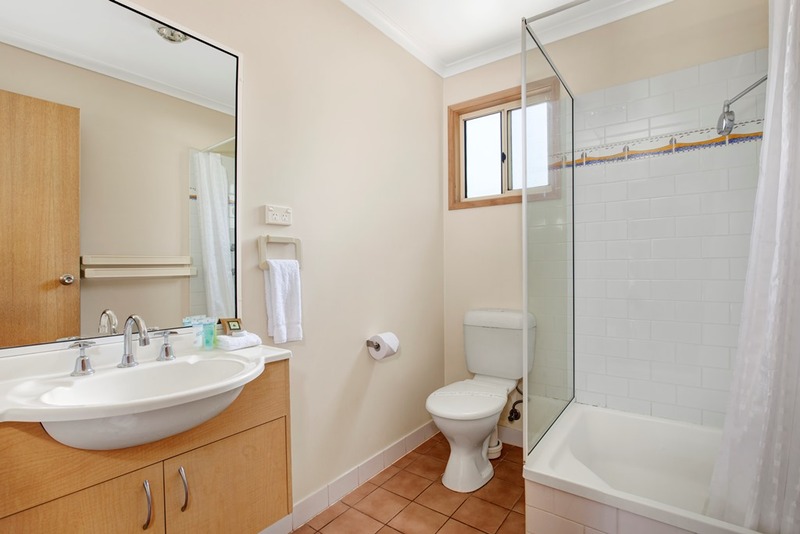 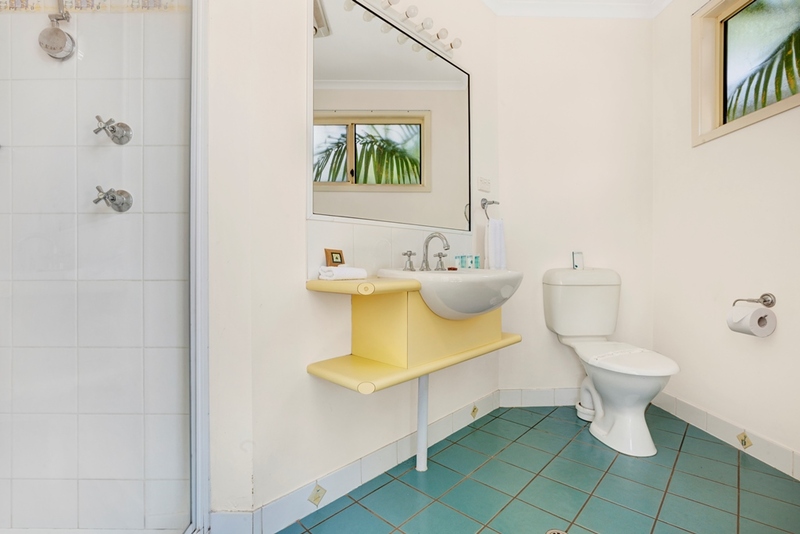 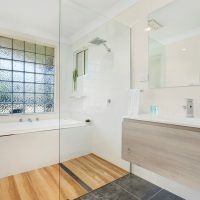 These are beachside sites with individual and private bathrooms including a shower, basin and toilet. 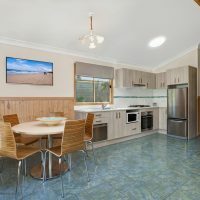 These sites have access to water and power. 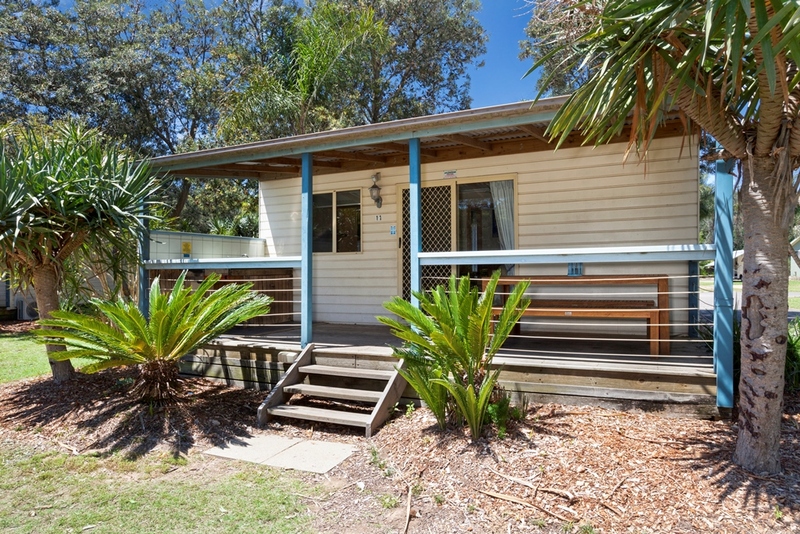 Beachside sites are approximately 1 minute from the water. 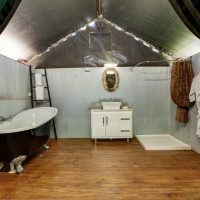 These sites have access to water and power. 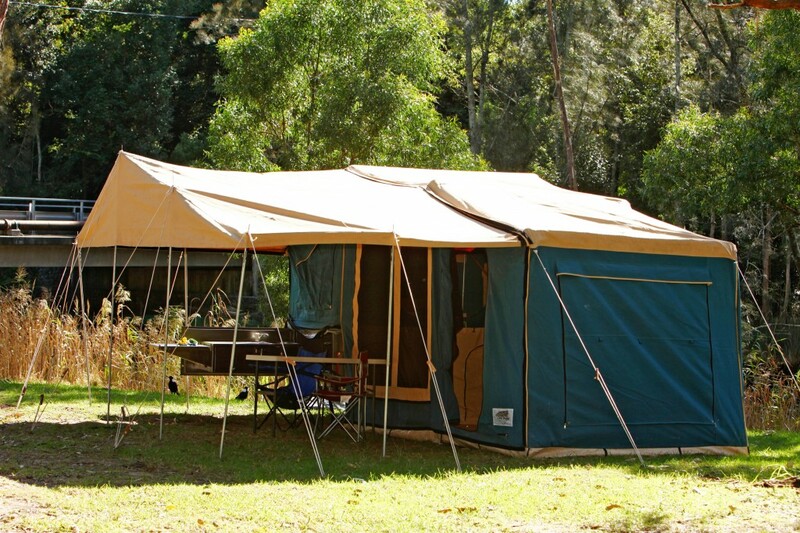 And are available for tents, motorhomes, caravans, camper- trailers and buses. 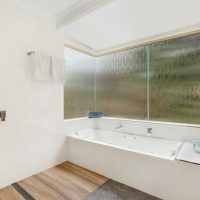 They are available with or without slabs. 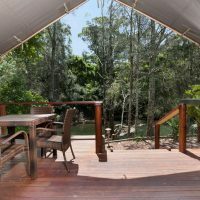 The Powered Riverside sites have access to water and power. 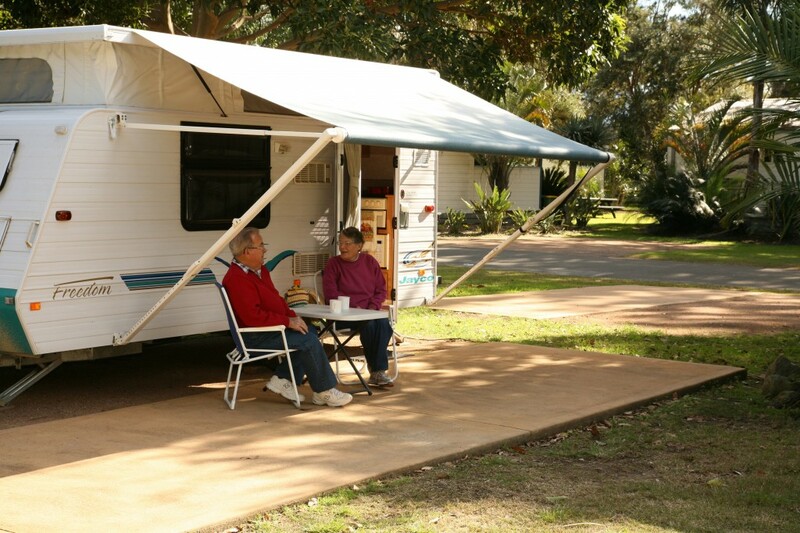 And are available for tents, motorhomes, caravans, camper- trailers and buses. 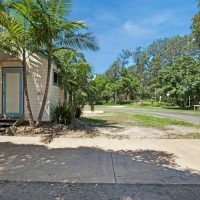 They do not have concrete slabs. 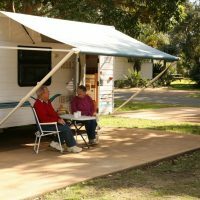 The unpowered sites are suitable for camping and are great for groups. 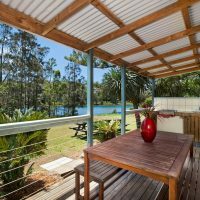 These sites are close to the water with all of them having river views.